Ever since the beginning of time, mankind has always wanted more. From the ever notorious Britney Spears song "Gimme More" to the whines of an infant baby (not that I am comparing the two, har har) it has become a part of our everyday lives. Just like all other human instincts, this extends to the sphere of computers, where we have outgrown the single monitor and require a second. Although Microsoft has made it easy to setup a second monitor to a PC, it's got a definite lack of features. Thankfully third-party applications have always been there to fill the gap - and again, a certain application makes its way to do so - a certain application we call UltraMon. We'll take a look at UltraMon 3.0.1, currently still in beta, on Windows Vista. On the last day of 2007, I was entrusted with the task of reporting this piece of software. However, I wanted to brave it out and try to use a dual monitor setup without UltraMon. Needless to say, overall I felt the experience was a bit more convenient, but still a bit incomplete, as many features were unavailable. For example, I couldn't easily tile two different pieces of wallpaper together on my monitors without firing up Photoshop and spend the next ten minutes editing. Also, I couldn't get the monitors set up to display a single piece of wallpaper nicely; as I am using a laptop screen with a pretty standard 17" LG Flatron L1730s, the displays were not parallel with the laptop sitting lower than the LG L1730s, which was bolstered by a stand which I had to compensate the height in Windows display settings. I even tried using the "Tile" selection without any edits, but the wallpaper actually did end up tiling which gave a pretty, for lack of better word, ugly effect, although it was the closest to achieving what I really wanted. I gave it up, and retreated to the refuge of UltraMon. After installing and activating UltraMon, I was ready to go. First thing I noticed were the two buttons that were added to the top of my window, which can be disabled. 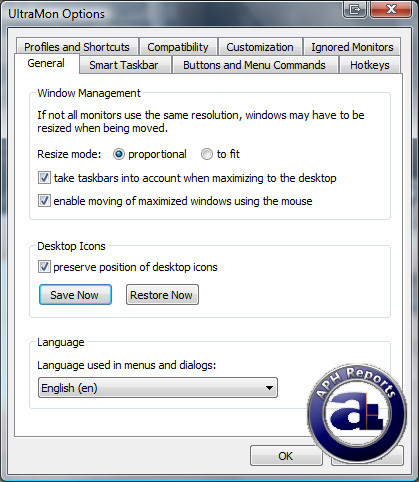 Sitting beside the "minimize" button, there were two new ones; I realized one was to stretch the window to the length of the two monitors, and the other was to transfer the window to the next monitor - also known as the Maximize to Desktop command and the Move Window command respectively. And they worked like a charm, to my delight. Not to mention they actually blended in quite well with the rest of the Vista GUI. Maximized windows can be dragged between monitors regardless. I love it! I learned that right-clicking the UltraMon icon in the System Tray would lead to a menu, from which to select all the options. Simple, but it works, and it's fast. ...which also meant I needed a new piece of wallpaper for further testing, because I don't exactly enjoy disproportionately stretched images. That's just nit-picking though - after a few minutes of browsing through InterfaceLIFT, I found a nice image that centered very smoothly. I also easily configured the monitor setup so that the wallpaper adapted to the lower monitor, and all was good. I later found out that UltraMon actually tiled the wallpaper so that it emitted a "seamless" effect - something that Windows already did, just not as well as UltraMon. If you were sharp, you would also have noticed the taskbar being stretched to the second monitor with the Smart Taskbar feature in UltraMon (Which can be enabled or disabled to your preference, by the way) -- something that Windows isn't capable of doing on it's own. The taskbar actually behaves like the Windows taskbar - it can be moved to the different sides of the monitor, and can also be stretched once the main taskbar is unlocked. Another start orb would've been interesting, but on second thought it might've been just a bit too much. Also, the time and the system tray are retained on the main taskbar. Thank goodness the UltraMon designers had more insight than I did. It's quite reassuring to know that you have much more desktop real estate with dual monitor setups - usable desktop real estate - that you can jumble all those icons onto. UltraMon is there to enhance your experience. Of course, if you're clean and organized like me (or just don't bother with desktop icons) then you've got nothing to worry about and can be symmetrical or something interesting like that. And of course, I'm going to move the taskbar back down - the whole side-taskbar-situation was just to prove that it could move and be stretched and whatnot. With the information that UltraMon could do more than what I imagined in my mind, I set out on a second quest - this time to discover UltraMon's potential and push it to the limit. Boy, I was quite excited at the moment. Deciding to move from the top down, I started with Profiles, as I had already tinkered with Settings. Basically, the Profile allows you to save your current configuration, and continue on. It also allows you to create shortcuts from preset places like your desktop to any custom folder. It also enables you to select which profile to apply upon logging in, which is quite convenient. Then I got to another more graphically interesting part of the program - the screensavers. Although I don't use screensavers much as I turn my monitors off - or close the laptop lid - for energy saving purposes, I broke my personal law and decided to try it out - like a little kid trying out exquisite candy in a foreign candy store. And it turned out that I could use two different screensavers on the different monitors - wow! Of course, I could simply stretch a single screensaver too, but why would I want to do that? I thought that I wouldn't be able to print-screen a screensaver, as the print-screen would exit the screensaver. My father always taught me that trying never hurt though, so I gave it a shot and it turned out quite wonderfully. Of course, the screensavers got quite wonky after a while, but they're were interestingly addictive. If only Microsoft made a modern version of that Windows 98 Maze screensaver, I could stare at the screens for days. Seriously though, as a kid I was mystified by them. For the next option, Shortcuts, I wasn't expecting too much, to be honest. To my surprise, it was actually a very useful tool - I was expecting it to create shortcuts of simply just the UltraMon options, but it creates a shortcut for any application, and when selected, opens upon logging in. 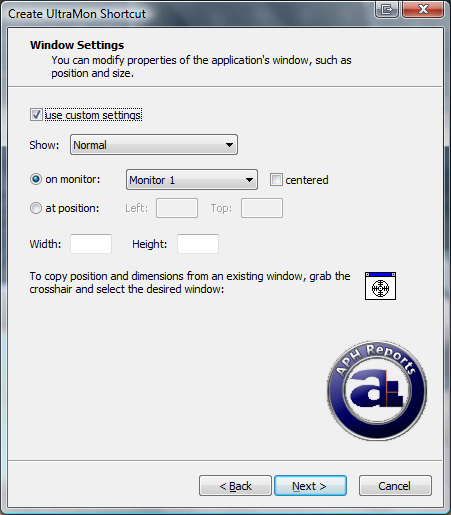 The most interesting aspect was the crosshair tool - upon choosing your application and the location of the shortcut, you will be given a crosshair tool to select any open window - and the shortcut will run the application in that window size. You can also choose where it goes by changing pixel values, or simply center it. 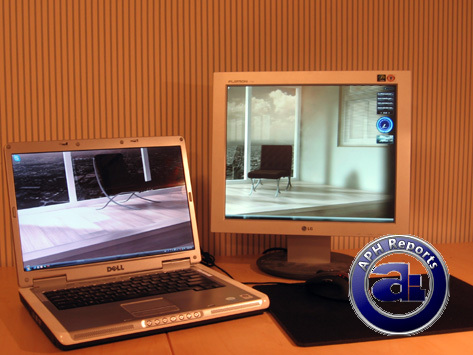 However, the only issue that was found by APH Networks testers was one with 3D games, specifically Source games (such as Half Life 2) - when a shortcut is created for them and selected to display on the secondary monitor, the game will load on the secondary monitor but ends up on the primary monitor regardless. Still, shortcuts were much more powerful than I had expected. The next option, Wallpaper, was the first one I tweaked, so let's move on to the next one. Desktop icons was relatively simple - it had two selections: Restore Position and Save Position. By saving, you can drag them around and make funky patterns or whatever floats your boat - I made a cross that I was very proud of, and then simply restore their old position. Worked without a kink, as expected. The next option, Disable Secondary, does just that - very fast. My monitor shut off within a second and the sidebar moved back to the first. Of course, then I selected Enable Secondary so that it didn't look that crowded, and it turned back on within two seconds. Dang, twice as long as turning it off - although the speeds were still more than acceptable. The next option leads to a Windows function - called Windows Display Properties - the one I used a lot before UltraMon. It's got some use, like maneuvering how the monitors are placed, but I found it lacking in the wallpaper department. The universal feature also applies to UltraMon, and the feature is General Options. Here you can tweak the options themselves, such as if you want a Smart Taskbar to appear - that's the second taskbar on the second monitor - or if you want those two funky buttons to appear on all your windows. The next three aren't too important - Help, About, and Close. Oh, sure, Help might be considered somewhat important, but who needs Help? Just kidding. About shows information about your monitor and who your UltraMon application is registered to. And I can only wonder what the Close button does. My first is just a series of bugs - if you run a flash-based screensaver in multi-monitor mode, there will be a white line on the screen that is running the flash-based screensaver. Luckily, Windows' default screensavers aren't flash-based, so you can always turn to them for security. Another bug has to do with Rainlender and the Smart Taskbar on 3.0 Beta 2. If you've enabled Smart Taskbar and you have the Rainlender on the second monitor, a reboot of the computer will result in the application being displayed on the second monitor's Smart Taskbar. So far, the only way to get rid of this is to disable and then re-enable Smart Taskbar - however, this only applies to Vista users like myself. However, if you're clever like myself (actually my review mentor) then you'd find the patch for the Smart Taskbar in the UltraMon forums and download it to remedy Smart Taskbar issues. Also, I've found a whole list of things that really grinded my gears. First off, why the heck do they have to have two separate screensavers going on simultaneously? Sure, it's a ridiculously wonderful advance in technology, but they'll kill my eyes and make me wear thicker glasses than I already have to. And don't get me started on the ... just kidding, UltraMon's been great - in fact, the function that impressed me most was very possibly the screensavers. Mmm, colors. If you're going to get dual monitors and you're expecting half a decent experience, don't go without UltraMon. Sure, Windows works with a second monitor - but just barely. Windows just doesn't have those options that UltraMon does. UltraMon doesn't hog resources, it works smoothly even though mine was still in Beta, and it makes dual monitors look good. If you want two screensavers at once, you're going to need the full version of UltraMon! I, a buffoon, had hardly any trouble with this piece of software and was very motivated by it's functionality to write this review without any kinks. If you're not sure about it, head over to Realtime Soft and download the trial of UltraMon for your computer! Use it at full function for thirty days - and if you like it, purchase it for just $39.95. Volume discounts are available, but they will be added to the same account and be registered to the same person/company.